To ensure that the MX960 delivers the lowest cost per port without sacrificing performance, reliability, scalability or functionality, it has been purpos-built to optimize both switching and carrier-class Ethernet routing functionality. To ensure that the MX960 delivers the lowest cost per port without sacrificing performance, reliability, scalability or functionality, it has been purpose-built to optimize both switching and carrier-class Ethernet routing functionality. Ethernet-based services present a significant new revenue opportunity for service providers. Pre-owned Juniper MX960 routers build on the specifications of less-powerful modular MX Series routers, offering even more scalability and flexibility for setting up port configurations. 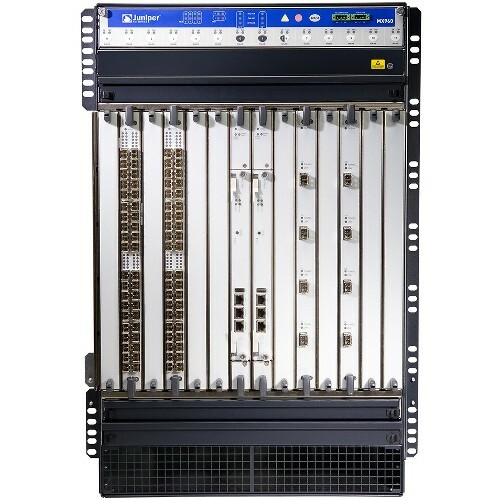 The MX960 is used to deliver a variety of services in high-demand environments, including service provider, cable, mobile and data center networks. Pre-owned Juniper MX960 routers are a long-term solution for advanced networking applications. It’s large size, 16 rack units (RU), allows it to support up to 12 Modular Port Concentrators (MPC). Each MPC holds multiple Modular Interface Cards (MIC), which are designed with different port configurations. The MX960 has a maximum capacity of 10.56 Tbps, which is twice the maximum capacity of the MX480 – the MX Series router that’s a step down from the MX960 router. The MX960 also supports nearly twice as many 1G, 10G, 40G, and 100G Ethernet ports as the MX480. Another major difference between the MX960 and other MX Series routers is the fact that all the MPC slots are oriented vertically. That means air will flow from front to back. In routers designed with slots oriented horizontally, such as the MX240 and the MX480, air flows from side to side. Nearly every specification of Juniper MX960 routers is double that of MX480 routers, including the number of slots and the maximum capacity. For more information on our pre-owned, in-stock MX960 Juniper routers, please contact us. We can send you PDF datasheets with detailed specifications you can use to compare used MX960 routers to other MX Series routers and determine which hardware best suits your needs. As an independent stocking dealer of used MX960 routers, we can offer discount prices that you won’t find anywhere else. 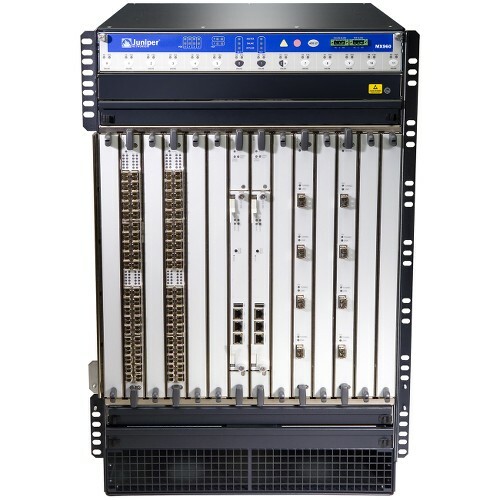 We specialize in selling pre-owned equipment to large-scale enterprises and service providers, but we also sell pre-owned Juniper MX960 routers to individuals and offer bulk purchasing to other hardware dealers. Replacing and upgrading networking equipment can be a significant and inconvenient expense, although – in most cases – it’s a necessity. At BrightStar Systems, our mission is to provide access to high-quality, pre-owned MX960 routers at cost-effective prices. And with more than 20 years of industry experience, we’ve been able to build a business model that successfully supports that mission. If you’re interested in purchasing pre-owned MX960 routers, please reach out to our sales team. Selling BrightStar Systems your pre-owned Juniper MX960 routers is the best way to turn your equipment into a financial asset. We purchase used MX960 routers from anywhere in the world and we pay to have it shipped, regardless of the size of the order. If it requires freight shipping, we’ll set that up for you as well. And if you’re unsure whether or not some of your equipment works properly, we can test it for you to find out. Our hands-on approach makes it easy and worthwhile to sale your pre-owned MX960 routers. We do all the heavy lifting, and because we’re an independent dealer, we’re able to offer top dollar for your used equipment. Please contact us today if you’re interested in selling your used surplus Juniper MX960 routers and we’ll get the process started right away. When you sell us equipment, we ask that you provide a list of every item you’re planning to sell. We then make an offer for those specific items, and we’ll even pay you in advance. As long there are no issues with the hardware, you’ll keep all of the initial payment. We follow a similar process for selling items. We ask which items you’re looking to buy and then we send a quote for those items. Once we’ve settled on a final price, we’ll complete the transaction and ship your order right away. We keep an inventory of used equipment on hand, which means there’s no delay between completing a payment and shipping your order. It’s a quick, efficient process that’s designed to get your equipment to you as fast as possible. Not only do we want you to be satisfied with the condition of your equipment when it arrives; we also want you to feel confident in your hardware’s ability to perform without any problems. That’s why we run our pre-owned MX960 routers through a series of quality control tests, which ensure the hardware you purchase is well-equipped to take on the most demanding workloads. In the case any issues do come up, you’re covered for the first year by BrightStar Systems’ 1-Year In-House Warranty. Reach out to our team of experienced network professionals today if you’re interested in buying or selling your used Juniper MX960 routers. Read more about Juniper’s MX960 specs with the suggested downloadable PDF datasheet. Contact us about preowned MX960 routers with our BrightStar Systems’ 1-Year In-House Warranty. We buy and sell used Juniper networking equipment. Please contact us to buy or sell any pre-owned or surplus routers.